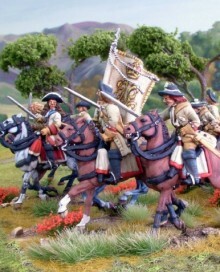 I am very proud of this pre production unit of Jacobite Horse painted as Galmoys Regiment. The attracted a lot of attention at the show. Pre orders for the FIELD GUN and POSITIONAL GUN can now be placed in the shop. The guns come with 4 and 6 crew respectively. Two new codes WLOA12 & WLOA13 can also be found in the shop. These are the long awaited mixed codes.